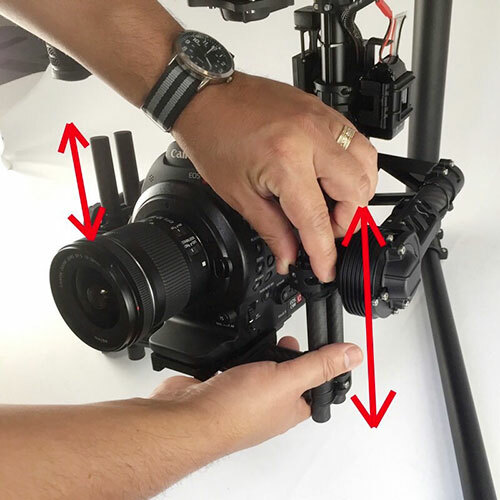 This is a short and sweet “How To” with images that explains how to balance a Canon C100 MkII with a Canon 10-18mm EFS macro on a MoVI M5. We hope it strikes the right balance between detailed and succinct. Also, if you’re in Austin and you’d like to see this set-up in-person, then drop by our CANON SUMMER SHOW: Wednesday, June 10th! 3. Tighten the bottom middle toggle clamp to lock the camera plate in position. Note – Please be sure the toggle clamp is adequately tight. 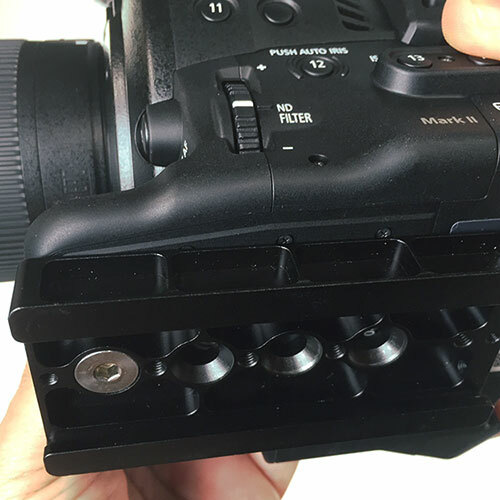 The toggle clamp holds the camera and camera rail onto the MoVI, so it is important it is securely clamped. (See tears and regret statement in step 2.) Make sure this tilt front/back balance is achieved before moving on to the next step. 4. Adjust the vertical balance, loosen the 4 toggle clamps on the middle of the four small side tubes. Adjust the camera position vertically until it is balanced such that you can rotate the camera to any tilt angle and it will naturally stay wherever you leave it. Make sure this tilt verticle balance is achieved before moving on to the next step. 5. 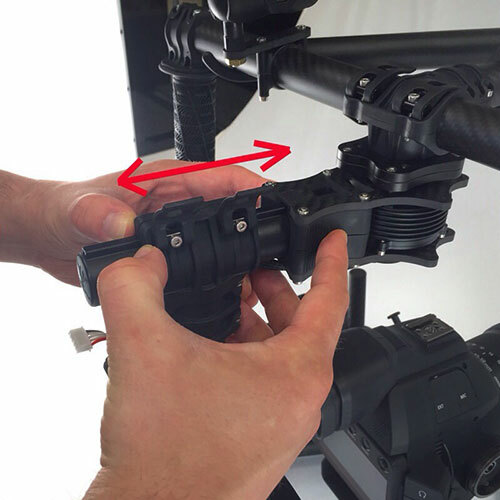 Adjust roll balance by loosening the 2 bottom outer toggle clamps. 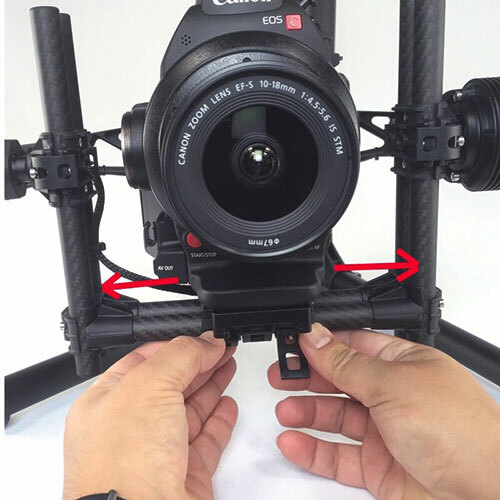 This will allow the camera and cage to slide side-to-side to achieve roll balance. Make sure this roll balance is achieved before moving on to the next step. 6. 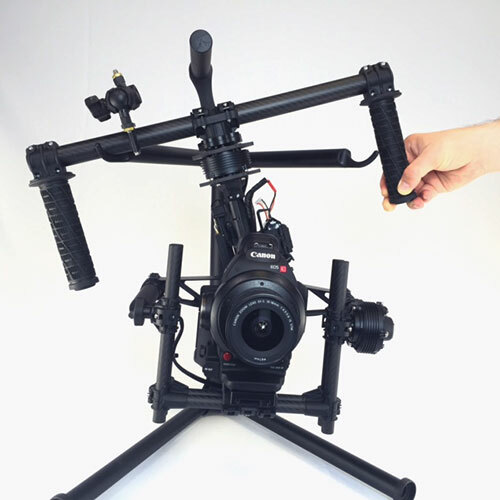 Slightly tilt the MoVI in the stand and see which way the Pan Axis swings. The clamp that holds the vertical tube to the top horizontal tube is the only adjustment for Pan Axis balance. By sliding this joint forward/backward we can achieve proper Pan balance. A.) 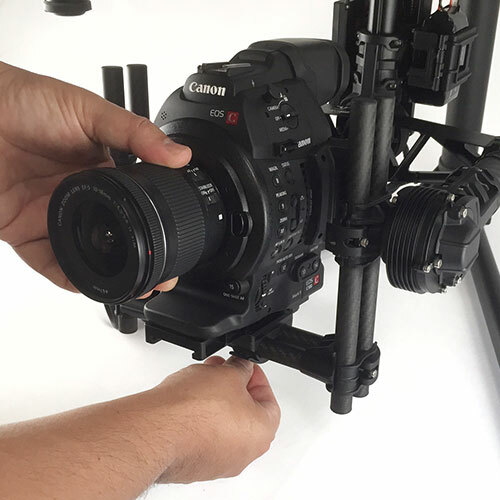 The viewfinder of the C100 MkII will hit the back brace bar of the MoVI resulting in an upward tilt limit of only approximately 25 degrees. Downward tilt has clearance of close to 180 degrees… you’ll see the MoVI back brace through your lens before the lens hits. B.) The big difference in balancing between the DJI Ronin and Freefly’s MoVI – MoVI seems to have a little more drag in it’s motors during balancing. Which, at first glance, might seem like a bad thing, but ultimately results in a little more forgiveness while balancing. Where as the Ronin motors seem to be frictionless making the balancing process as fulfilling, fun and time consuming as making diagrams with straws, talking about time travel… thank you Bruce Willis.